Public interest in nutrition for maintaining good health throughout life has never been stronger. Completing a degree in dietetics and nutrition is your first step to becoming a Registered Dietitian Nutritionist (RDN; also known as an RD). RDNs work with people of all ages, cultures, and economic means. They are credentialed health professionals who apply nutritional science to individuals, families, communities, and beyond to help their clients address nutritional needs. People are increasingly interested in the nutritional requirements for obtaining good health and long life. Registered dietitian nutritionists (RDNs) work with people of all ages, cultures, and economic means. They learn to understand people as individuals, thereby helping their clients solve their nutritional needs. RDNs are health professionals who apply the art and science of food and nutrition. The major leads to a BS degree that meets the educational requirements of the Academy of Nutrition and Dietetics. The pre-professional phase (years 1 and 2) involves core courses in science, food science, basic nutrition, mathematics, liberal arts, and business. The professional phase (years 3 and 4) includes practicum experiences in various upper-division courses. Three cooperative work experiences, including one position in health care food and nutrition services, are a requirement of the major. Students also have the opportunity to acquire a certificate or minor in a variety of content areas, including exercise science. To become credentialed as an RDN students also need to complete an accredited supervised practice after graduation and pass the National Registration Exam for Dietitian Nutritionists. Part of the Wegmans School of Health and Nutrition, the BS program in dietetics and nutrition is a challenging curriculum that prepares students to become RDNs and to practice in diverse settings such as hospitals, clinical practices, other health care facilities, universities, government agencies, research facilities, food and pharmaceutical companies, public health organizations, public wellness programs, school food-service, commercial foodservice, journalism, marketing, sports nutrition, and corporate wellness programs. A successful program with a significant history at RIT. The dietetics and nutrition program originated in 1892 as a food program under RIT’s predecessor, Mechanics Institute. Faculty with strong teaching and research skills who have won awards for teaching and conducting research. They have presented research at national and international conferences and routinely publish in peer-reviewed science and health journals. The mission of RIT’s dietetics and nutrition major is based on the philosophy that a college graduate should have a broad-based education. This encompasses meeting the current and future needs of students including preparation for registration eligibility and successful supervised practice as well as careers in the changing food and nutrition environment to better serve society. Prepare students for successful application to accredited supervised practice programs and/or graduate school and to become competent, entry-level Registered Dietitian Nutritionists. Objective: Over a five-year period, the program will achieve at least an 80% first time pass rate on RD exam. Objective: 75% of students enrolled are expected to complete the program within 150% of the time planned for completion, i.e., 3 years from the start of the third year. Outcome: 100% of students complete the program. Objective: 95% of supervised practice directors will verify that students were adequately prepared for supervised practice. Outcome: 100% of supervised practice directors verified that students were prepared. Objective: 95% of graduates who complete supervised practice will verify that they were prepared. Outcome: 100% of graduates verified that they were prepared. Objective: 85% of program students applying to graduate school will be accepted. Outcome: 100% of students were accepted. Objective: 100% of students in the third and fourth year of the program will be members of the Academy of Nutrition and Dietetics (AND). Students may also elect to be members of other national nutrition-focused organizations (e.g., Society for Nutrition Education and Behavior, American Society for Nutrition, International Society for Behavioral Nutrition and Physical Activity). Outcome: 100% of third- and fourth-year students are AND members. Outcome: 100% of graduates in past five years who became RDNs have maintained their RDN status. Successful completion of the BS in dietetics and nutrition degree requirements; including three blocks of approved cooperative education experience. Complete an ACEND accredited 1,200 hour supervised practice program, such as a dietetic internship or coordinated master’s program after graduation. Pass the CDR Credentialing Exam for Dietitians. In addition to the professional credential of the RDN, forty-six states currently have statutory provisions (licensure/certification) regarding professional regulation of dietitians and/or nutritionists. Information regarding statutes of individual states is provided by the Academy of Nutrition and Dietetics. Hospitals, HMOs, or other health care facilities: Educating patients about nutrition and administering medical nutrition therapy as part of the health care team. RDNs may also manage the foodservice operations in these settings, as well as in schools, day-care centers, and correctional facilities, overseeing everything from food purchasing and preparation to managing staff. Sports nutrition and corporate wellness programs: Educating clients about the connection between food, fitness, and health. Food and nutrition-related businesses and industries: Working in communications, consumer affairs, public relations, marketing, or product development. Private practice, working under contract with health care or food companies, or in their own business: RDNs may provide services to foodservice or restaurant managers, food vendors and distributors, athletes, nursing home residents, or company employees. Community and public health settings: RDNs teach, monitor, and advise the public, and help to improve quality of life through healthy eating habits. Universities and medical centers: Teaching physicians, nurses, dietetics students, and others the sophisticated science of food and nutrition. Research areas: In food and pharmaceutical companies, universities and hospitals, directing or conducting experiments to answer critical nutrition questions and find alternative foods or nutrition recommendations for the public. The dietetics and nutrition major is accredited through June 2023 by the Accreditation Council for Education in Nutrition and Dietetics (ACEND) of the Academy of Nutrition and Dietetics (AND), 120 South Riverside Plaza, Suite 2000, Chicago, IL 60606-6995. Cooperative education: Co-op is a full-time paid work experience for at least 400 hours in an industry related to food and nutrition. Students register for co-op just like a class but do not pay tuition. The course is graded as pass/fail. Students are required to complete three co–op experiences to receive their BS degree in dietetics and nutrition and the majority complete their co-op experiences in the summer. One co-op must be completed in a health care environment. For more information, please visit the Office of Career Service and Cooperative Education. A sample of co-op employers in the Rochester area includes Wegmans, Rochester General Hospital, Strong Memorial Hospital, Highland Hospital, St. John’s Home, RIT Dining Services, and Monroe Community Hospital. Students may complete co-ops in their hometown area as well as in other locations throughout the United States and while studying abroad. 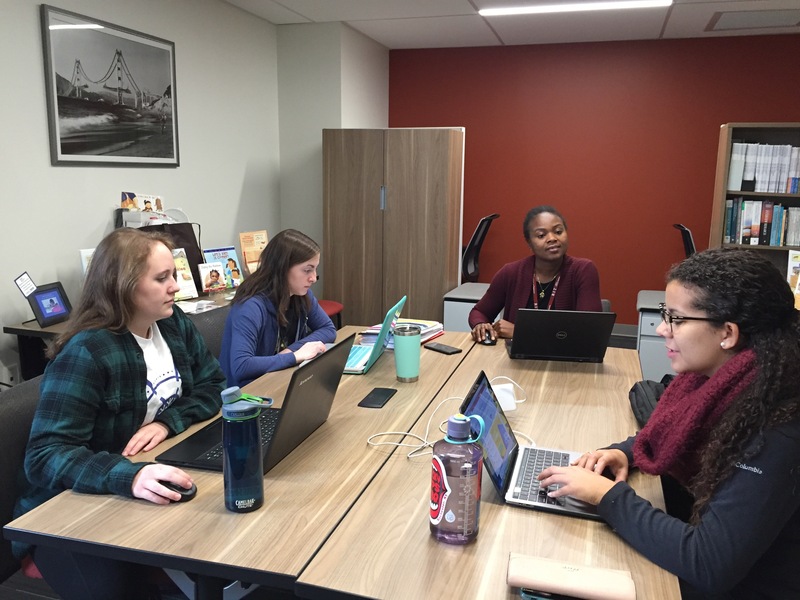 The dietetics and nutrition department offers faculty-led international experiences such as studying the Mediterranean diet in Croatia and travel to conduct a research project on childhood anemia in Ghana. The Student Dietetic Association is a student club comprised of dietetics and nutrition students to support experiential learning outside of the classroom. The club promotes health and nutrition on campus as well as volunteer opportunities with local organizations. Club activities include volunteering at local food banks and schools, presenting health related information at RIT events, and educational activities for members. Housed in the Wegmans School of Health and Nutrition, students may enhance their primary course of study by minoring in nutritional sciences, which focuses on nutrients and human nutrition issues. The study of nutrients includes knowledge about food sources, metabolism, and relationship to health. Nutrition influences and is affected by health, cultural issues, exercise science, food systems, hospitality, and behavior. For more information, visit the nutritional sciences minor page. Students in RIT’s Wegmans School of Health and Nutrition spent two weeks traversing Ghana as part of a global research experience to learn more about the toll of anemia on the West African nation’s women and children. Nina Hullett, who will earn her BS degree in nutrition management, is on the path to becoming a registered dietitian. This course will provide direct, practical experience for Nutrition Management students in quantity foods development, production and service operations. Students will rotate through several positions within the RIT food service department and become exposed to the many activities that are required to run a large scale food operation. RIT’s foodservice department will host Nutrition Management students for three hours each week as they are scheduled to work through various rotations in the department. This lab is taken in conjunction with the Food and Beverage Management course; HSPT-223. Introductory supervised practice/practicum course. This course explores the profession of dietetics which includes current dietetics practice as well as practice trends and career options. Students interact with a representative sampling of personnel in all areas of food and nutrition. Students will become familiar with current Academy of Nutrition and Dietetics Scope of Practice Framework, Standards of Professional Performance, and the Code of Ethics in the profession of Dietetics. The development of an outcome based professional portfolio is required. This course is a continuation of NUTR-525 Medical Nutrition Therapy I. Review and application of biological metabolism and interrelationships of nutrients, hormones, enzymes, and other biochemical substances in humans. Modification of nutritional intake to meet nutritional needs altered by diseases and stress as well as use of alternate methods of feeding (enteral/parenteral) to meet nutritional needs is discussed in depth. This course emphasizes the practical applications of medical nutritional therapy for use with patients/clients. Courses in liberal arts, sciences, and math. Science courses required.